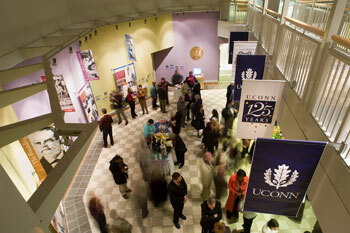 A view of the 125th Anniversary exhibit during the kick-off celebration held at the Wilbur Cross Building January 25. Al Rogers, Class of '53, shared his memories of a piece of UConn history with a crowd of several hundred people January 25 at the University’s 125th Anniversary kick-off celebration at the the Wilbur Cross Building. The University has received an interim arbitration decision that finds the University appropriately terminated HRH/Atlas Construction Inc. for its failure to fulfill its obligations as the general contractor for the construction of the Biology/Physics Building. In conjunction with the 250th anniversary of the birth of Revolutionary War hero Nathan Hale and the premiere of a new play celebrating the life of the pioneering civil rights advocate Prudence Crandall, the University will host a conference: “Heroism, Nationalism, and Human Rights ” in February. Paula Englehart McManus, 55, the Health Center’s associate vice president of planning died at home on Jan. 19, the victim of an apparent homicide.